How do I know who is present in my Team Room? 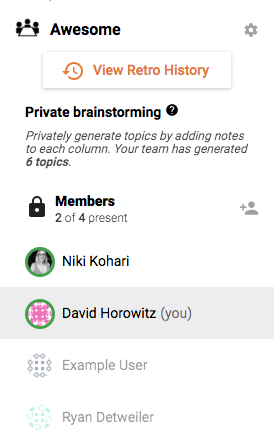 When you are in the Team Room, this left sidebar shows a list of everyone who has access to the Team Room within your Organization. Those who are currently present in the Team Room will be shown at the top of the “Members” list, and they’ll have an indicator to show they’re active. This not only shows you who can help with the grouping responsibilities during this step of the retrospective, but it also helps you understand who is participating in the retrospective without knowing exactly what that person is writing during the brainstorming step.